Every day – on land, on sea and in the air – MSF uses different modes of transport to ensure that supplies, equipment and medical staff are where they are needed. 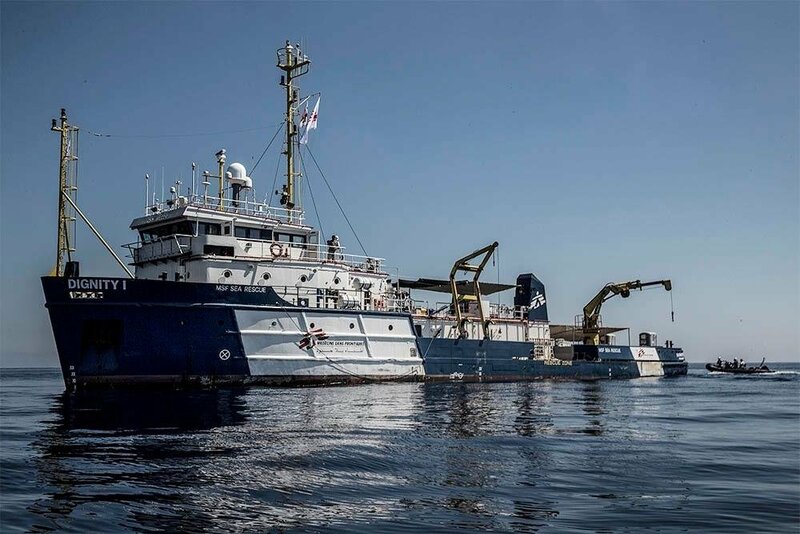 It’s complex, challenging and often dangerous work, in some of the world’s most extreme and remote environments. Here's how we get around. Here from Dispatches? Download our card game! An MSF ambulance drives over rough roads, from Mbitsi health clinic to Masisi hospital, with MSF midwife Sam Perkins and Zawadi, an 18-year-old expectant mother. This photo was taken as part of the www.msfdelivers.org fundraising campaign. The iconic MSF Toyota Land Cruiser 70 series is the backbone of every MSF mission. 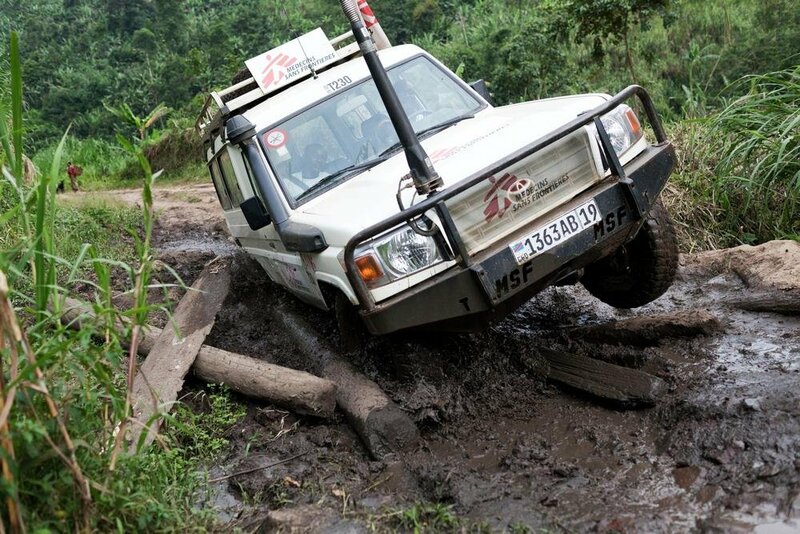 Rugged and dependable, MSF operates more than 800 of these go-anywhere vehicles across the globe. Many have been customised to function as top-of-the-range ambulances, while others are used to transport people, goods and equipment. Some terrain is too tough even for 4x4s. 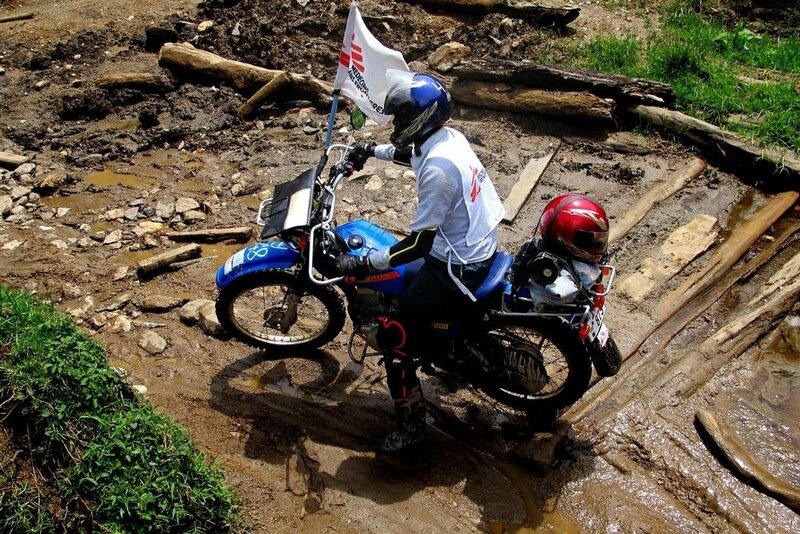 In Democratic Republic of Congo, MSF runs mobile clinics by motorbike. Known as the ‘bikers without borders’, these brave riders provide a lifeline to tens of thousands of people who would otherwise be deprived of healthcare, in a country which has less than one hospital bed per 1,000 inhabitants and fewer than two doctors per 10,000 people. Le 26 juin 2012. Yida, Soudan du sud. Camp de refugies de Yida. // PHOTOS : V. WARTNER/20 MINUTES.South Sudan, Yida refugee camp. In the aftermath of a natural disaster or in the middle of a conflict, roads are often destroyed or dangerous. 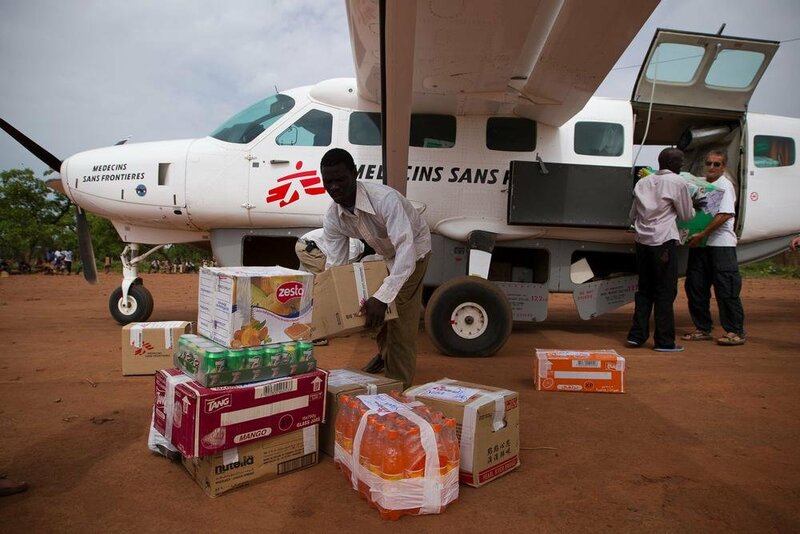 We use cargo planes to quickly transport large quantities of medical supplies and aid to where they are needed, and we use light aircraft to help our teams reach the most remote communities, and to transfer patients to hospital. MSF staff visiting remote villages along the coastline of Aceh in the northern Sumatra province of Indonesia. MSF has two helicopers that ferry staff and supplies to the areas MSF teams are working. Staff are kept to a minimum and the rest of the plane is filled with rice, water and essential supplies. On the return trip, patients are brought back to Banda Aceh for more treatment. The helicopter’s unique ability to take off and land vertically ensures they are often used by MSF to reach stranded communities in areas where runways are nonexistent or have been destroyed by conflict or natural disasters such as earthquakes. 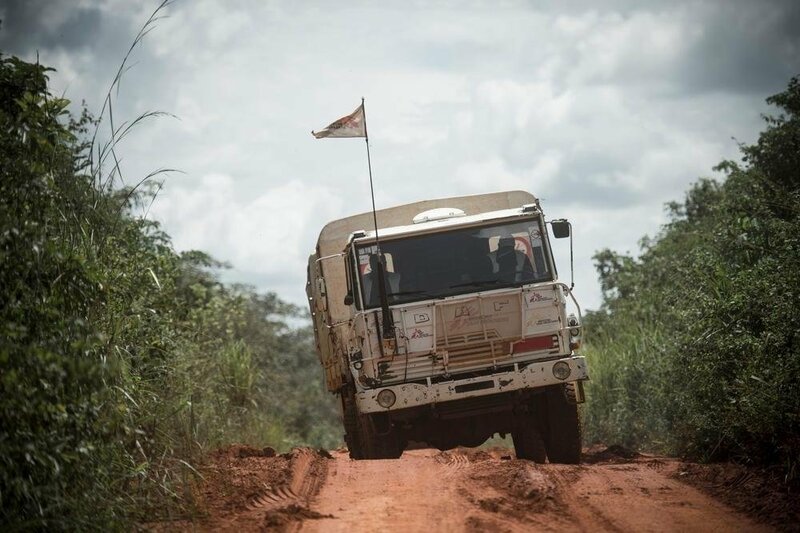 CENTRAL AFRICAN REPUBLIC, GRIMARI, 28 SEPTEMBER 2014 An MSF-supply truck makes its way on a difficult stretch of road from Grimari towards Bambari, in the province of Ouaka (CAR). As well as carrying goods, MSF uses converted trucks as mobile clinics and laboratories. In Uganda and Zimbabwe, staff in MSF’s mobile HIV units are able to diagnose patients within 15 minutes and start them on treatment on the spot. In a world where more than half the 35 million people with HIV are unaware they are carrying the virus, these mobile clinics help prevent people from getting sick, and reduce the chances of them infecting others. Boats and ships of all kinds are vital to the work that MSF does, whether rescuing refugees from the Mediterranean using a 66-metre off shore supply vessel (the Bourbon Argos), or delivering vital supplies such as shelter materials, hygiene kits, cooking utensils, blankets and mosquito nets to islands in the Philippines devastated by Typhoon Haiyan. The community in Kerema town watch with anticipation during a UAV demonstration flight. 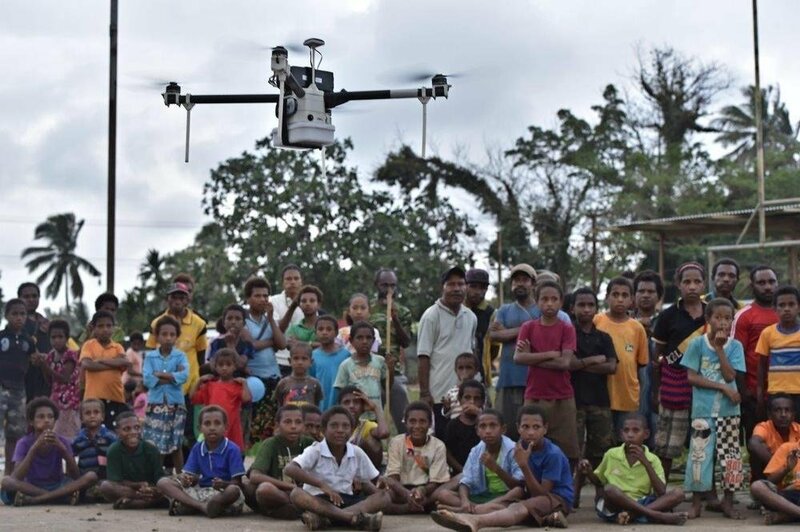 In Papua New Guinea, MSF is running an innovative Unmanned Aerial Vehicle (UAV) programme to help fight tuberculosis (TB). 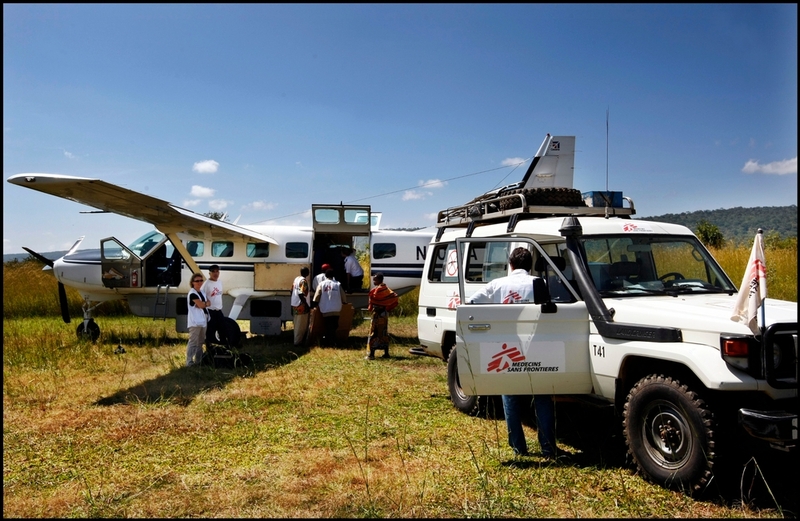 MSF teams travel to isolated villages to collect sputum samples, which are then flown back by UAV for testing. In the future, we hope that the UAVs will also be used to transport anti-TB medicines back to the patient. MSF teams travel on horseback and carry supplies by hand across difficult terrain in the Mejo Woredas (division) in the Sidama Zone of Ethiopia. 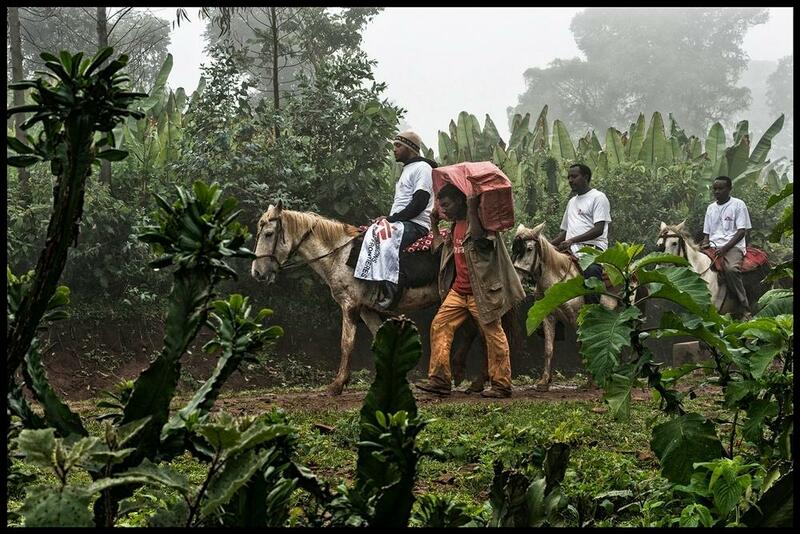 In areas such as the Sidama hills of Ethiopia and parts of Colombia, horses and ponies provide the easiest way of travelling through diffi cult jungle terrain to reach isolated communities and people cut off from healthcare. 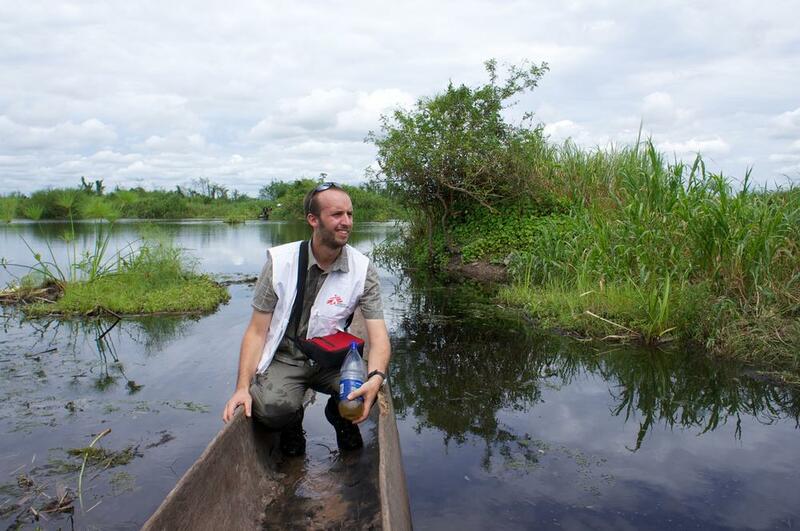 portrait of Guillaume Brumagne (MSF logistician).A Kabalo, dans la province du Katanga, en République démocratique du Congo, le paludisme est endémique avec une période de pic relativement longue (de septembre à avril). Il est la principale cause de morbidité et de mortalité chez les enfants de moins de 5 ans. Selon les anciens, le changement climatique se traduit par des pluies plus fréquentes et plus denses qui contribuent à l?augmentation des zones marécageuses. En parallèle, la culture rizicole s?intensifie et le climat tropical génère une atmosphère très humide favorable au développement des moustiques. Après une première intervention dans la zone en début d?année 2012, MSF assure à nouveau la prise en charge des cas de paludisme et de rougeole à l?hôpital de Kabalo et dans 8 centres de santé périphériques, depuis octobre 2012. En à peine plus de trois mois d?intervention, l?équipe a traité plus de 25 000 enfants pour paludisme. In Kabalo, in the province of Katanga, Democratic Republic of the Congo, malaria is endemic with a relatively long peak period (September to April). It is the leading cause of morbidity and mortality for children under 5 years. According to ancients, climate change leads to more frequent and denser rainfalls that contribute to the increase in marshy areas. In parallel, rice farming intensifies and tropical climate creates a very humid atmosphere conducive to the development of mosquitoes. After an initial intervention in the area in early 2012, MSF provides support to treat new cases of malaria and measles at Kabalo hospital and in eight peripheral health centers since October 2012. In just over three months of intervention, the team has treated more than 25,000 children for malaria. In many parts of the world where MSF works, large inland rivers operate like modern highways and the canoe is comparable to the car. These canoes range in style from fast and sleek motorised canoes to traditional wooden dugouts. 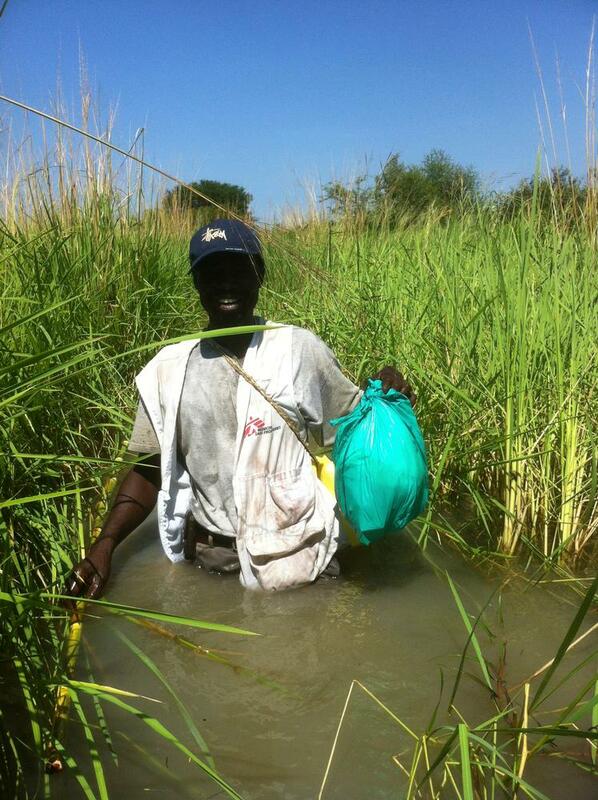 Crossing a stream on the trek from Lankien to Padding for the non-food item distribution. When the mountain is too high or the terrain too rough, or when there are no cars, trucks, boats or planes to hand, sometimes the only option is to go by foot. 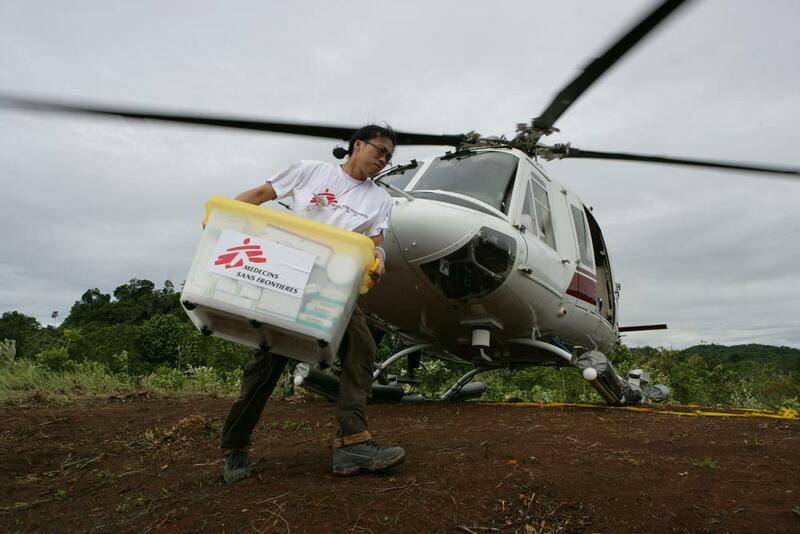 Each year, MSF teams walk millions of miles to provide healthcare to people in desperate need. Play the MSF transport game! 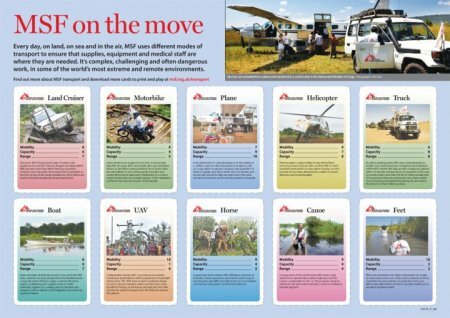 Click on the image above to download our MSF transport card game!